The Texas LGBT Chambers of Commerce, along with the Tyler Area Chamber of Commerce, have joined with the GLBT Chamber of Commerce Foundation to offer LGBT WE Zone counter signs and window stickers throughout the state. The WE Zone program began in North Texas in July 2015. Since then, more than 200 WE Zone 'kits' have been sent to welcoming and inclusive businesses throughout Texas, as well as 26 states, and three countries. With the combined efforts of the Austin LGBT Chamber of Commerce, Greater Houston LGBT Chamber of Commerce, North Texas GLBT Chamber of Commerce, San Antonio LGBT Chamber of Commerce, and Tyler Area Chamber of Commerce we expect the WE Zone to become THE symbol of inclusion throughout Texas. Click on the link below to order your free LGBT WE Zone kit today. 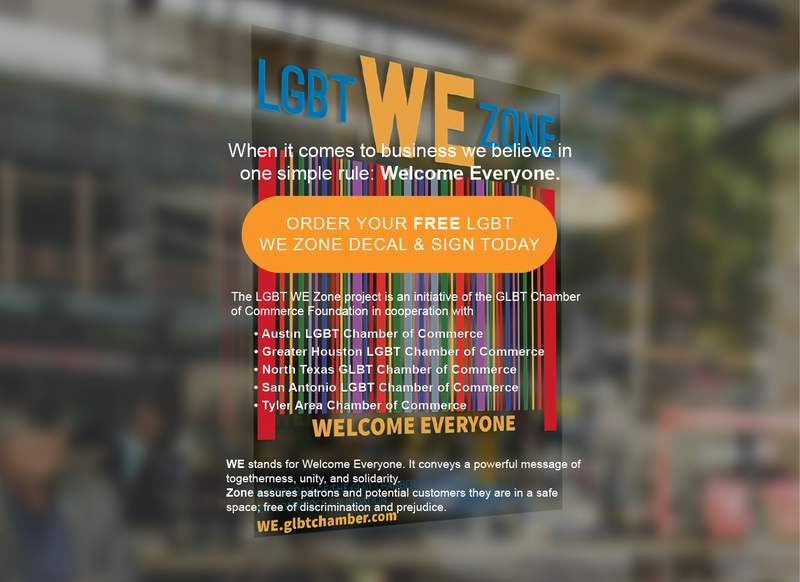 Click here to order your FREE LGBT WE Zone decals & signs today!